It's official, the Tookany/Tacony-Frankford Watershed Partnership Inc. or TTF has moved its office location to Globe Dye Works (GDW), joining the expansive community of businesses, entrepreneurs, artisans, and artists setting up shop in the converted factory building. Located seven miles from City Hall in the Frankford section of Philadelphia, GDW opened its doors back in 1865, running a yarn dyeing and winding business for nearly one hundred years. The factory enjoyed close proximity to the Tacony Creek over these years, with free-flowing water that fed its yarn dying process. When the original GDW closed its doors in 2005, The Globe Development Group had the insight to redesign, repurpose, and reopen the 30,000 + sq. ft. factory space to meet the needs of emerging industry and creativity. For now, Julie Slavet and the rest of the TTF staff are settling in nicely, dedicating themselves to their on-going mission of restoring and maintaining the health and vitality of the Tookany/Tacony-Frankford Creek and its watershed. But with the freshness of new paint and tenants in the air, Slavet is definitely looking forward to the coming months at GDW -- she is already excited to host the Open House at the Globe Dye Works in September. This event will allow the factory’s artisans, boat builders, caterers, bakers, brewers, and manufacturers to meet and greet the growing community of independent makers and environmental caretakers working out of Globe Dye Works. 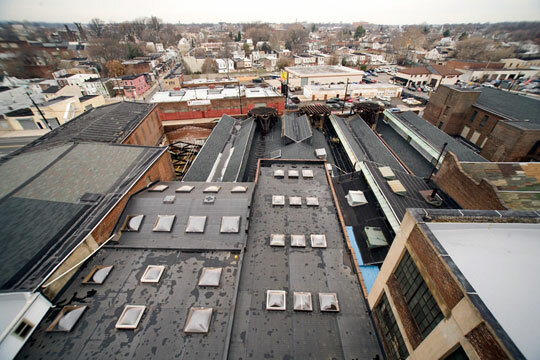 Visit Globe Dye Works, and Tookany/Tacony-Frankford Watershed Partnership online for more information.